Two new seasonal routes from Bournemouth Airport to the Channel Islands have been unveiled for 2019. Flights to Jersey and Guernsey are scheduled from April to October by Scottish airline Loganair – the carrier’s first operations from the regional airport on the South Coast. Stephen Gill, Managing Director, Bournemouth Airport, which is owned and operated by Regional & City Airports (RCA), said: “We warmly welcome Loganair and its cabin crews to our growing regional airport, where 35 destinations in 15 countries are being served. NEW ROUTES: Andrew Bell, Chief Executive Officer of Regional & City Airports, right, which owns and operates Bournemouth Airport, and Stephen Gill, the airport’s Managing Director. Scottish airline Loganair has announced new routes from the airport to the Channel Islands for 2019. 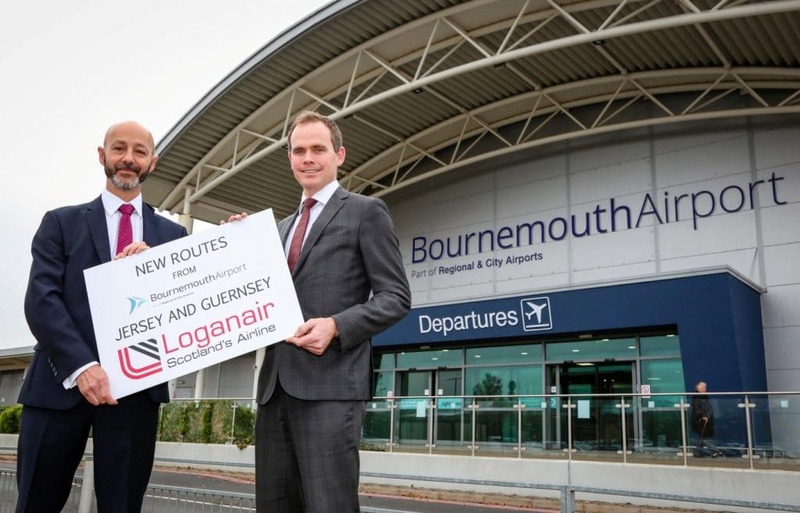 Jonathan Hinkles, Loganair’s Managing Director, said: “Our two new routes to Jersey and Guernsey will make travel to these popular leisure and corporate destinations more convenient for passengers within Bournemouth Airport’s large catchment area. Last year the carrier rebranded, with tartan tails for its aircraft and traditional tartan uniforms for cabin crew and ground staff. Founded in 1962 as Scotland’s airline, Loganair serves more than 40 routes across the UK, Republic of Ireland and Norway. Night mail flights for the Royal Mail are also provided. Logainair is famous for the world’s shortest scheduled flight – two minutes’ block time – between Westray and Papa Westray in the Orkney Islands. The new routes announcement comes just 11 months after the airports management division of Rigby Group plc acquired Bournemouth Airport, with ambitions to drive growth across its operations, including doubling passenger numbers to 1.5 million over the next five years. RCA owns and operates Bournemouth Airport, Coventry Airport, Exeter Airport and Norwich Airport and has contracts to operate Solent Airport, near Portsmouth, City of Derry Airport and Blackpool Airport. Deputy Dawn Tindall, member of the States of Guernsey’s Committee for Economic Development, said: “The announcement by Loganair that they will commence a new seasonal service to Guernsey from Bournemouth next year is excellent news. “It is the second new service announced by Loganair since the commencement of the ‘Open Skies’ policy in September this year and illustrates their confidence in the market opportunities offered by Guernsey.